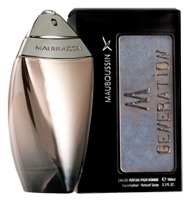 Mauboussin has launched M Generation, a "fragrance that highlights the timeless elegance of a confident man". The notes for the spicy wood fragrance include bergamot, ginger, nutmeg, pink pepper, Szechuan pepper, iris, incense, cinnamon, jasmine, rockrose, labdanum, cedar, sandalwood and guaiac wood. It was developed by perfumers Henri Bergia and Claire Chambert. That’s a lot of ingredients, but it sound like something I’d like to try (though it seems more cool-weather friendly). I need to hunt my sample of original Mauboussin, which I remember as a nice one that gets so many raves. Someone sent me a sample which I never tried until recently. I did like it alot. The only thing is that they didnt specify if it was mens or womens. Which one are you referring to Joe? C, the one I’m referring to is their original, just called “Mauboussin”… it’s sort of a woody/fruity thing, almost like a Serge… but different. It’s the one that seems to get a lot of love amongs the “Fumeheads.” HA! This sounds nicer to me than the original, which was fine, but not love for me. i thought rockrose and labdanum were the same thing. why are they listed as two distinct notes? Well, it reads sniff worthy to me – probably a little woodier and drier than the original Mauboussin which I do love. I liked the original fairly well, but found a little on the fruitcake-y side. I mean, like really *good* old-fashioned fruitcake, with currants and raisins and spices and good cream cheese icing – no rainbow-colored candied fruit – but maybe a bit sweet. So I’m intrigued by something that might be a little drier. I think Mauboussin and Badgley Mischka are about as fruit cake sweet as I like to get. I find M to be a little lighter on her toes. I haven’t smelled Badgley Mischka. (I was about to abbreviate that and decided it would be a bad idea…) Mauboussin is nice and rich. Ann—you turned me onto the original Mauboussin and I suspect that it was either you or me that sent samples to Joe and Carlos….so guys the one you have is probably technically for women (because of course men could wear neither fruit nor floral notes….) the original is gourmandy and fruit cakey—but I like that. The original Mauboussin is one of the few fruity fragrances that I really like. To me it has a shimmering effect, kinda like lightly glazed dried fruit. I don’t find it very sweet at all. Rich, yes! sounds delicious, I’ve tried lots of men’s scents but am only familiar with Maboussin for women. Hopefully the bergamot and ginger are prominent.